After seeing our blogs, have you ever asked the question Who is Southern Front Door? Maybe you’ve wondered about our team and their amount of experience within the custom door industry. We understand the importance of knowing the background of a company, and we are delighted to share our history with you. This business is family owned and operated business. The company was started in 1996 by Sam and Susan Fortenberry but was later purchased by Jesse and Liz in 2014. 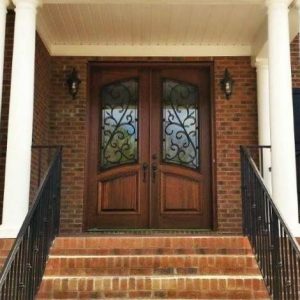 Together, the team of Southern Front Doors has twenty-eight years of experience in the door and glass industry. We commit to either meeting or beating our competitors on any exact product. Southern Front Door offers a vast inventory and multiple in-house functions. We offer standard size and custom products made specifically for you. .We stain our wood, and we have our own prehang and prefinish departments. We offer professional installation for our Houston clients. Additionally, we provide our Crate & Freight Program to our clients outside of the Houston area. This program consists of curbside delivery to your location of choice. Now that you know us, we want to get to know you. Visit us today so we can get to know your style and what you are looking for in dream custom door. For more information, contact us at 281.890.5860 or visit our website here. We can’t wait to meet you!! !